MOOCs – those Massive Open Online Courses that deliver learning content online – are the focus of several upcoming Techniques in Learning and Teaching posts. In part, the series is prompted by the May through June launching of five initial University of Minnesota MOOCs via the Coursera platform. Home to what are known as “xMOOCs.” Additionally, the series is prompted by numerous broader conversations about learning, teaching and higher education that bear thinking through as we all step back from this year’s teaching to reflect on next courses and possibilities. With next week’s attention to the U’s Coursera offerings, the posts will set out some basics about xMOOCs – purpose, practices, pedagogy. With posts three through five in the series, the writers will explore a broader set of purposes, practices and pedagogies emerging in the MOOCs and higher education landscapes: cMOOCs, and pMOOCs, and xMOOCs. Oh, my! Today, the series opens with a focus on metaphor for learning and learners in the eLearning contexts that includes MOOCs. That I’m thinking about learners should surprise no one who’s read my previous. Similarly unsurprising would be my assertion that language matters in framing our thinking about learners and learning, especially as we venture with them into eLearning. In writing this post, I draw on my own experience with MOOCs of many types and in roles from full participant to active lurker to design team member to creator of my forthcoming OOPs with its MOOC roots. In the space of this post is move us toward a sturdier metaphor to draw on as we imagine and design courses. Specifically, I will suggest why to move away from the Digital Natives-Digital Immigrants binary, and propose that the emerging Liminal Participant-Skilled Orienteer framing is sturdier – as more supple and less hierarchical, more dynamic and less binary – metaphor. All credit for the sturdier metaphor belongs to the creators of the Oxford Brookes’ not so massive OOC – First Steps into Learning and Teaching in Higher Education – now in its second iteration as #FSTL13. By the end of May, I will have participated in some way in both offerings. Marc Prensky’s construction of digital natives and digital immigrants as distinct generations and as speakers of distinctly different languages never worked for me. On hearing it a dozen years ago, I had several concerns while watching the connotative impact on my undergraduate students: most of them speaking accented world English or English as a second or third or fourth language, they found a metaphor that didn’t invite living in multiple rich worlds. I also had concerns about the impact of the language on my colleagues who were struggling but finding ways to bring computer and internet possibilities into their pedagogical considerations but found younger techs dismissive of the teachers who’d experienced multiple pre-digital technologies. Also, I didn’t see “digital” as beginning with the emergence personal computers and the internet. For me, digital touches back to alphabets, to the abacus, to Morse cod, to Braille’s character encoding via patterned variations of six dots, and to generations of typesetting technologies living in newspaper backrooms. For me, technology shifts were present in everyday facets of family life: the carpentry tools of my grandfather, the farming machinery of my uncles, the industrial painting mechanism at my father’s workplace. Whether attached to digital or not, this binary fixing via natives and immigrants never works for me. It presumes the “native” language is superior, the speaker fluent, and the rules neutral. It seemed then, and still seems to me now, to exist without a sense of personal practice, cultural histories or social hierarchies. The binary fabricates a generational rift rather than mining the resources of intergenerational differences spurring exchanges. Were we to cast the speaking of digital as parallel to the speaking of a language, it would be safe to say that digital is no one’s first language. No one is a native speaker of digital, of technology, of computers. And not all speakers of digital speaks or understands or lives out its grammars in a singular way. As with any language, no single generation creates, engages, changes or owns the social, cultural and political aspects of life that encompass development and use of a language. In learning, hearing, speaking and teaching languages, I’ve watch my students and my colleagues’ students wrestle with etymologies, accents, rules of construction that work and those that need to be broken in order to work for particular audiences and contexts. Language learners – in first or tenth languages – build understandings of language by speaking with others across generations and countries and continents. Guidance from other speakers helps us in learning to create semantic mashups to make meanings and to make ourselves understood. We languish as learners when we create castes of speakers – native and non-native, fluent and English language learners, citizens and immigrants – rather than move as travelers and guides along continuums where any one single language is differently spoken and heard, used and created. Therefore, I propose the digital native-digital immigrant is a broken metaphor. In accepting the idea that digital can be a native language, we are open to privileging speakers “born into” the language – semantically, culturally, economically – over those who were born before or some other way outside of the language. As a teacher, I remind myself that I came to academic language having first experienced several other languages even within English: the dialects of home, of working class, of friends, of public school, of community life, of dissertations, of academic articles, of popular publications – and as often of the many networked, electronic spaces I’ve travelled beginning with holes punched on salmon-colored cards or into rolls of yellow tape that I fed into devices that produced data printouts or columns of typesetting I could interpret and share. more skilled in developing good web browser search strings? more deft in evaluating even the academic sources they find online? more conversational in their posted responses to peers in discussion threads? more willing to figure out how a new tool or platform works by experimenting and applying previous experience before emailing you those Help me! or Dumb technology doesn’t work! messages. Or perhaps consider all the times that you wished more students (and colleagues) did not assume that a teacher’s age was a factor in determining whether, how and which technologies would play a role shaping a course. I find that I walked away from this divided metaphor from the start for one primary reason: it works to characterize and group people into moments and modes we can analyse. Not so much a continuum along which we travel but a set of dyads with one serving as a primary residence. A social justice community engagement continuum exercise I’m familiar with asks participants to hear a question then map themselves onto a space in the room that reflects where they stand in response to the question. At one end of the continuum is “charity;” at the other “radical social justice;” and at points between a range of namings that reflect skills and beliefs across the full stretch. The one time I facilitated this exercise with a colleague, Eric, the service learning students in our workshop cohort pointed out that Eric and I never stood in one place; rather, we wove about from one end of the continuum to the other. As a continuum mapping skills and beliefs, we did find that we would have to move about in order to reflect how we thought and might act in response to the social, cultural, political and community contexts of each “mapping” prompt. The continuum required thinking about context, community and collaboration. This is how I find myself poised when I think through animating the liminal participant – skilled orienteer journey. Thinking of daily life, I certainly think of many ways in which I am a participant during an ordinary day. Among them: I interact with peers, I create insights by interaction in classrooms with students, I make use of multiple virtual platforms to speak with colleagues and family members and people I “know” only virtually through an affinity or interest we share. Across these participations, I sometimes find myself relying on others to orient me to features or dynamics or practices within the places where we interact – and sometimes I am the orienteer for others. 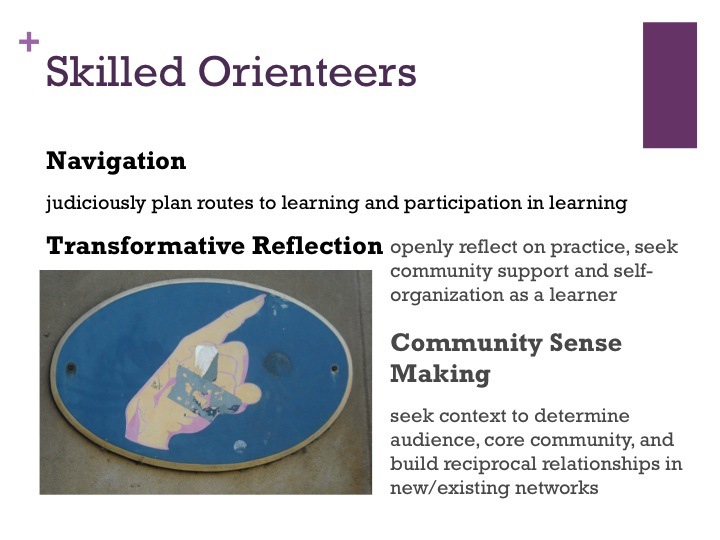 In the combination of participant and orienteer, we’re given a “yes, and…” framework for the improvisation that is at the heart of discovery-based, constructivist and transformative learning. This combination reminds me that in working with technology – whether simply getting out of a stuck place that comes in the form of a frozen screen or in the form of having so many options for moving and thinking that not moving or thinking emerges as a best or only choice – I am as likely to operate as a practitioner and as am to become an orienteer – and even more likely I will be somewhere along the stretch in the midst of a community, a cohort or a collaborative that will inhabit the full spectrum. With skill we come into reflection – the meta-processing of learning to learn that helps us see why something worked or did not, to discern what helped, to review how others approached the circumstance, to reflect on how we shifted in our ways of seeing, and to draw on this emergent understanding to organize next ways of doing things. This reflection brings us into a closer relationship with other participants – whether as peers-colleagues or learners-students – in order to construct meaning. By making use of navigation and reflection skills, we develop the skills required to make sense of community. We come to think about audiences around us, to make choices about how best to communicate ideas to multiple audiences, and to “realized reciprocal relationships” as essential for participation and orienteering. A skilled orienteer twines together two capacities. With the first, she navigates, reflects, makes sense of learning and of community; with the second, she interacts with others who are new to the context – who may otherwise be left feeling overwhelmed by encountering new learning junctures, numbing technology requirements, numerous pathways, or knotty rules of engagement. In higher education, the orienteer is likely to encounter a new student, new teacher, new user of a particular technology, or someone facing new knowledge that troubles previously organized beliefs, practices, analyses. That person could well be the liminal participant. Liminal – that other modifying word in this twin-track metaphor of liminal participant and skilled orienteer – suggests someone or something on the verge something: perhaps discovery, perhaps discouragement. I learned liminality as a helpful concept while researching why, when, how women leave domestic violence as a masters degree student in Women’s Studies and English. I understood liminality as troublesome experience while in PhD school trying to pass through rituals of mastery and inclusion – exams, prospectus, dissertation writing – by absorbing tacit cues and clues. In each case, liminality had to do with being a place between, with being both in the middle and midst of change while also being momentarily pinned somewhere between what I had believed and what I would come to believe. In the middest. This portal could be a gateway to change or a precipice – depending on whether and which guides stepped up. A liminal participant then is someone who needs partnering with a skilled orienteer. As a teacher, sometimes my skilled orienteer is a student, sometimes a peer or a friend or family member or even someone embedded in my personal learning community where I make sense of ideas by reading and hearing others I meet only virtually. Ideally, this skilled orienteer for my liminal participant self will sometimes be my own self in critical reflection. The skilled orienteers for my students will as diverse and distributed, as local and global, as real and virtual. At some point in my day tomorrow I will be a liminal participant in a virtual space with colleagues and also in a face-to-face curriculum planning session with a consultee. During the course of this same tomorrow I will be a skilled orienteer when I log on to a current MOOC session and when I talk with a MOOC teacher about assessments to be developed for the course. In each of these conversations the participants will be entering into novel and reciprocal relationships to make meaning. In each of these interactions, participants will be expected to learn and to lead. Anticipating these liminal moments, we can anticipate, build in opportunities for participants and orienteers to meet so that each will gain new skills to carry them forward, perhaps crossing into new thresholds of knowing in and beyond course platforms. 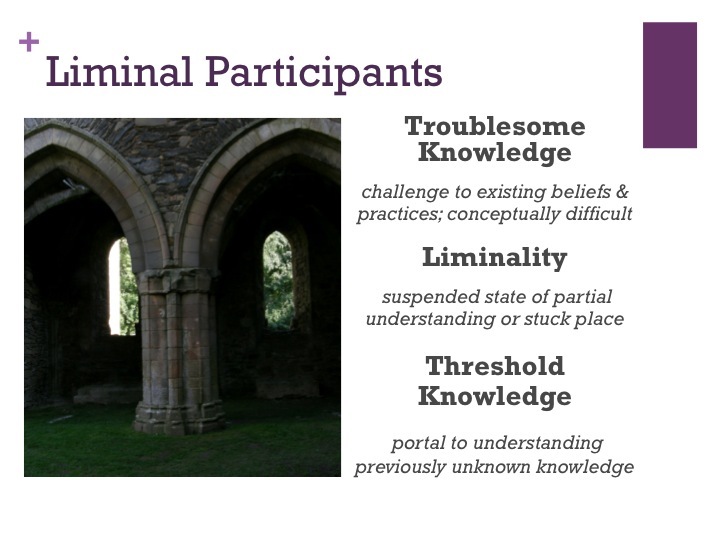 In each of these liminal moments and roles, we can struggle with the learning rather than the metaphor. In each of these liminal interactions, we can learn to move among many places rather than reify boundaries. Dave White and Alison LeCornu. “Visitors and Residents: A New Typology for Online Engagement.” First Monday 16.9 (Sept. 2011): http://firstmonday.org/ojs/index.php/fm/article/view/3171/3049. White and LeCornu address the digital-native construct and present the visitor-residents construct as a replacement continuum accounting for “people behaving in different ways when using technology…without categorising them according to age or background.” Still, “residents” are semantically, socially and legally privileged over “visitors” in many contexts in ways that can constrain this metaphor as well. Jenny Mackness. “Threshold Concepts and Troublesome Knowledge.” Jenny Connected 7 December 2012: http://jennymackness.wordpress.com/2012/12/07/threshold-concepts-and-troublesome-knowledge/. George Roberts. Various presentations on MOOCs and OOCs at Slideshare.net, primarily “OOCs for the Rest of Us.” March 2013: http://www.slideshare.net/georgeroberts/oocs-for-the-rest-of-us. Forthcoming: Marion Waite, Jenny Macknes, George Roberts, and Liz Lovegrove. “Liminal Participants & Skilled Orienteers: A Case Study of Learner Participation in a MOOC for New Lecturers.” Journal of Online Learning and Teaching: 2013. Thanks Ilene for your reflections on the liminal participant – skilled orienteer metaphor. 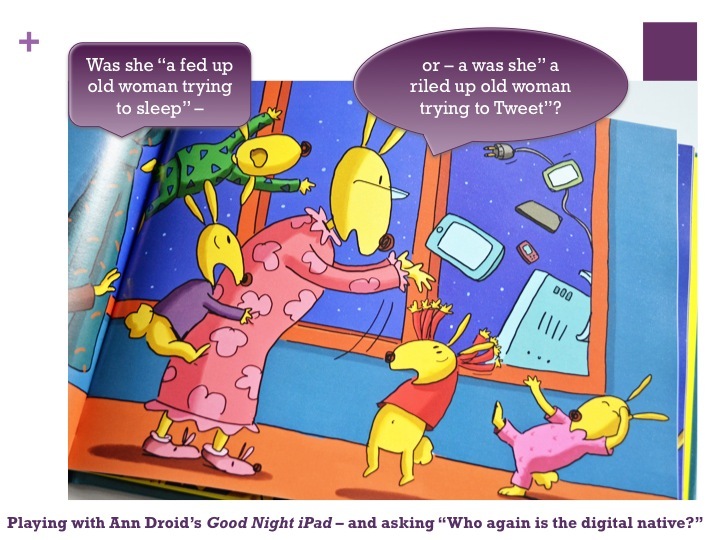 On reading your post I am struck by the thought that as with digital natives and digital immigrants, we should be careful not to think of participants as being either/or liminal participants or skilled orienteers, even when we recognise the context dependency of the metaphor. Would it be more helpful to think of a coninuum – which then immediately reminds me of Etienne’s writing about learners being on a trajectory from legitimate persipheral participation to competence. You can see that your post has got me thinking! Hi Jenny – Thanks for the comment, and the timing! My waking up thought this morning was of a way to bring in a continuum example that wasn’t quite willing to be written as I faced midnight and hit publish last night. After typing those ideas to Update the post, your comment came into my mailbox. And my thinking “Exactly!” in response to your noting Etienne’s trajectory ideas. I think to keep sorting this out in terms of teaching, I’m going to need to return to my personal blog for thinking through why-how the metaphor you all have animated can work in conjunction with Doris Santoro Gomez’s writing about student-centered pedagogies and “women’s proper place” – her undoing of the margin-center dichotomy for a more active continuum of interactions among teachers and students, students and students, both at individual, team and whole group levels. Thanks again! Thanks for highlighting a useful (non-)dichotomy in “liminal participants” and “skilled orienteers”. I’m struck by the kind of care, hospitality, and pedagogical-mindedness it takes to be a good “skilled orienteer”. I’ve seen that kind of hospitality in so many spaces in my life over the last few years: from language learning situations to hackathons to informal study groups. It’s good to have a name for it, and a standard of care to hold myself to when I’m called to be “skilled orienteer”. Ah, thanks for putting ideas here and pushing thinking! Becker, Samuel L. “Tolerance Is Not Enough.” Vital Speeches Of The Day 57.18 (1991): 575. Business Source Premier. Web. 16 May 2013.